Bob Owens was born and raised in Southern California. He earned his Bachelors degree from Loma Linda University in 1978. His first public accounting job was with a regional firm based in Beverly Hills, California, where he received his training in the audit department. Most of the clients were garment manufacturers, and it was in this environment that he developed his great audit instincts. Several years later he went to work as the Controller of a partnership syndication firm that developed and operated over 200 separate entities involved in Agriculture, Commercial Recreation, and Entertainment. In 1987 he started his own public accounting firm, which specializes in financial statement audits and business planning. He is a member of the American Institute of Certified Public Accountants and the California Society of Certified Public Accountants. He also is an active member of the statewide committee on Accounting Principles & Auditing Standards of the California Society of Certified Public Accountants. His hobbies are golf, scuba diving, and snow skiing. John Kraul was born in Sacramento in 1954. He earned his bachelors degree from Seattle University in 1977. For the next 11 years he tried his hand in various ventures including an attempt at professional golf and owning his own landscape company. In addition, he worked in private industry as an accountant. 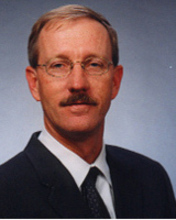 He has been an auditor with Robert Owens, C.P.A., since 1988, earning his C.P.A. certificate in 1990. The width of experience prior to public accounting played a part in giving him his personable demeanor. He has been well liked wherever he's been. 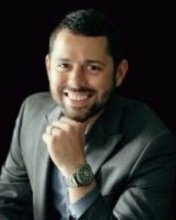 Combined with the depth of experience he has gained as an auditor, he is a uniquely qualified and approachable audit manager. John is a member of the American Institute of Certified Public Accountants and the California Society of Certified Public Accountants. His hobbies include golf, tennis, his two cats, and just about anything having to do with the enjoyment of nature. Allen Lee was born and raised within five miles of Disneyland (also the place of his first job ever). He earned his Bachelors degree from UCLA in 1989. His first public accounting job was in the downtown Los Angeles office of a national firm, where he received extensive training at both national headquarters and regional sites. Most of the clients he worked on were financial institutions, with a few retail and manufacturing clients. 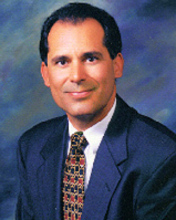 In 1990, Allen began working at Robert A. Owens, CPA A PAC. He has ten years of experience in both the audit and taxes of homeowners associations. Over the years, he has developed the audit program and training manual for the audits of these associations. He is the supervisor of the audit for a consulting firm with over $10 million of revenue. He has also been in-charge of the fieldwork for numerous escrow company audits. On a sabbatical to his ancestral home in Japan, he immersed himself in the Zen culture. With the help of his meditation instructor/wife, he hopes to become the Phil Jackson of the AICPA. He is the father of three and is attempting to form a family golf foursome. Their combined handicap still reaches far into triple digits. Jeremy Niswonger was born in Long Beach and raised in Southern California. He earned his bachelor’s degree from Cal State Long Beach in 2005. After graduating he worked as a managerial accountant in the community association industry reviewing financial statements and preparing budgets. He transitioned to public accounting by joining Robert A. Owens, CPA in 2009 and began working on the requirements to obtain his CPA certificate. In 2013 he fulfilled the requirements and became licensed. His prior experience in the community association industry made for a smooth transition to the firm and helped him understand the unique needs that come with the industry. 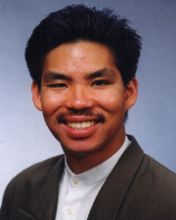 Jeremy is a member of the California Society of Certified Public Accountants. His hobbies include playing guitar and drums and he has been in many bands over the years. He had his first child, a girl, in 2013 and is enjoying being a husband and father. Chris Yao was born in Suzhou, a small town about forty miles away from Shanghai, China. She got her Bachelors degree in Business Management from Nanjing University in 1992. In 1995, she came to the United States and started to pursue a career in accounting. She attended evening classes at Cal State Fullerton while working as an accounting clerk for private companies. Those experiences, including working with one of the “Big Four” CPA firms in an IPO attempt, greatly helped her to understand the accounting principles she learned from classes. In 1999, she joined Robert A. Owens, CPA A PAC. In 2002, she took a temporary leave from the work and went to USC. One year later, she earned a Master degree in Business Taxation. Having been with Robert A. Owens, CPA for sixteen years, she has developed an efficient system for fieldwork and computer processing. She’s also in charge of training entry-level staff and supervising administrative personnel. Her hobbies include jogging, reading, and traveling. The nature of the CPA job allows her to work a light schedule during the off season, so she can enjoy being a soccer mom and witness a lot of milestones her son has achieved. 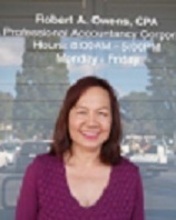 Jackie Le has been with the firm since 2010. Her people skills and personality are invaluable in serving our clients. She trained in accounting at Drury College in Springfield, Missouri and has been an accountant in the homeowners association industry for 15 years.